Saffron color dissolved in water. First, you will have to take the basmati rice and boil it in plenty of water. Since this is a sweet dish, you should not add salt to the water. Keep checking rice, whether it cooked or not. When it is just about to get fully cooked, remove from flame and drain water. Allow it to cool for sometime. To this drained rice, add sugar, saffron color, crushed saffron and cardamom. Next, in a pan, heat ghee and add cloves, dry fruits and cinnamon piece to it. A little later add rice to it. Cook for a couple of minutes and turn off the flame. When the water has fully evaporated, your sweet dish is ready to be served. 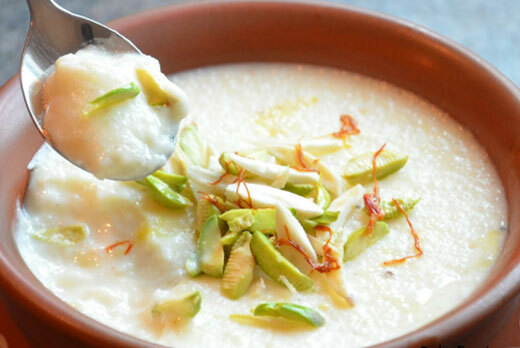 Tip: You should always serve sweet kesar rice hot and can also further garnish it with almonds, cashews and raisins.